In a way, you're paying a fair price for protection in your given territory. People act as if capitalism is some political concept that people are unable to grasp, yet the truth of the matter is that the real world is different. We have hundreds of militias representing different regions who are imperialistic, you're going to have to be protected wherever you're located one way or another. If you believe any of the premises are false, can you be specific about which, and why? Not sure if I disagree with anything. 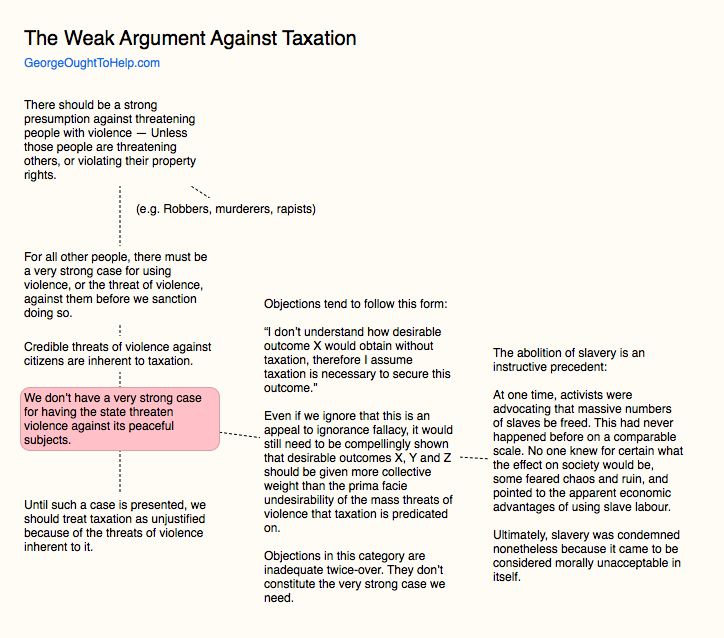 The title is "Weak argument against Taxation", and the article shows a graph on how taxation is immoral therefore tax is unjustified. In a way I agree with that. But as much as people wish to complain about things, if you aren't paying money for police or military then you are probably located in a country that's under attack anyhow. ..If the tax is the going rate for protection in my area, then maybe it is a justifiable price. That tax rate was decided in a market of governments, and all those governments had guns and opportunities to control different territories of land.